We denounce Indonesian government’s violent crackdown on civil society and peoples’ movements at the IMF-World Bank Group Annual Meeting in Bali. The national government and the IMF-WBG are to be held into account for shutting down the Peoples Global Conference against IMF-World Bank (PGC) and for suppressing voices critical to the IMF and World Bank. Such ridiculous requirements are obviously meant to throw a wrench into the conference and prevent the people from holding parallel actions such as the PGC that only seek to probe into the impacts of IMF and World Bank’s policies on grassroots communities and peoples who are often left behind in the development debate. Such dirty maneuvers make us wonder: why is the government of Indonesia under President Joko Widodo afraid of our conference? We decry the continued harassment of the leaders of the national organizing committee and the youth volunteers of the PGC. On Oct 10, a local village security group attacked the office of the Bali Legal Aid and drove away the PGC youth volunteers. Anonymous text messages were circulated to besmirch the conference as “anti-development” and the organizers “troublemakers”. Maliciously altered posters were disseminated in public spaces with the intent of linking the PGC to banned organizations in the country, compromising the security of conference organizers and participants in the process. We stand firm that the PGC is a forum for discussion on people-led and people-centered development and for solidarity with communities and sectors whose livelihoods have been destroyed, whose lands have been grabbed by foreign investors, who stand to suffer from climate change, and who are left to pay for the onerous, odious, and illegitimate debts incurred by their governments and used for purposes that did not serve the public’s interest and welfare. The real enemies of the Indonesian and the world’s peoples are those who profit hugely from the precarious conditions of millions of unemployed and underemployed workers and the dispossession of poor farmers and indigenous peoples’ lands. The real threat to democracy is posed by those who finance their greed through risk guarantees paid for by public money. The real terror is the deplorable condition of peoples of poor and underdeveloped countries suffering from years of economic plunder by foreign transnational corporations and local elite, enabled by international financial institutions such as the IMF and World Bank. The responsibility for the unjust shutting down of the PGC is also shared by the IMF and World Bank. These institutions are culpable for the ever shrinking space for peoples’ participation in development. This is not the first time that these institutions have chosen to hold their meeting in a country hostile to the free exercise of peoples’ right to assembly and speech. 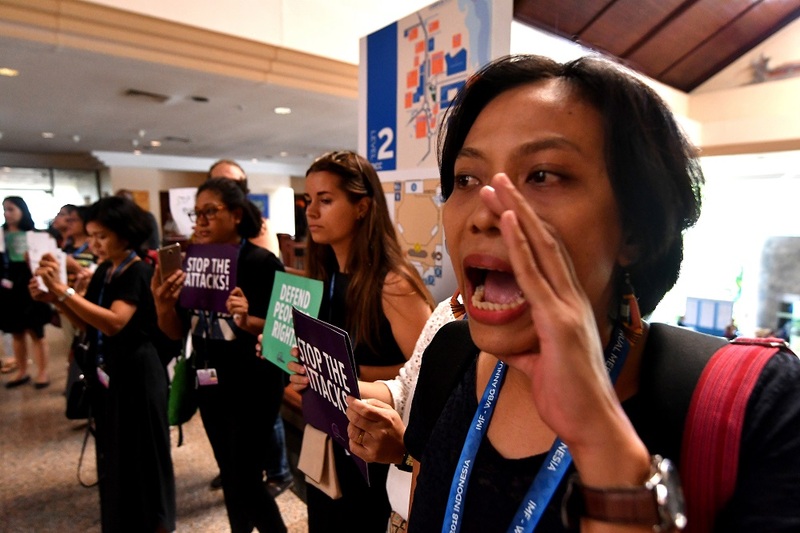 A small group of anti-IMF demonstrators shout and hold up placards saying “Stop the attacks” in one of the main venues at the International Monetary Fund (IMF) and World Bank annual meetings in Nusa Dua on Indonesias resort island of Bali on October 11, 2018. The Peoples’ Global Conference against IMF-World Bank Group (PGC) is a civil society and peoples’ movement-led conference organized in parallel to the official IMF-WBG Annual Meetings in Bali, Indonesia. The conference, which has attracted around 300 registrants from Indonesia and all over the world, seeks to discuss the impacts of IMF-World Bank’s policies to people and communities and their demands. In September, the government of Indonesia announced an island-wide ban of all public events during the IMF-WBG Annual Meetings. The announcement is clearly a violation of peoples’ freedom of assembly and expression. The PGC was organized in the auditorium of the Radio Republik Indonesia (RRI), a private space. The venue’s deposit had been paid on 24th September and the contract with the management had been signed on the same date. On Oct 10, 2018, the PGC national organizers received a message from the Radio Republic Indonesia management saying that the event was being cancelled because of lack of permit from the national police. The Bali police issued an island-wide ban of all public events during the IMF-WBG Annual Meetings in Bali, specifically from the 1st to the 15th of October. PGC national organizers and the Bali Intelligence Police subsequently held a dialog at the Bali Police headquarters. Around 100 activists held a demonstration outside to decry the ban. The Chief of the Bali Intelligence Police verbally agreed to lift the ban on the PGC and phoned the management of the RRI to allow the use of the RRI auditorium for the PGC from 10 to 14 October. AM: PGC held a press conference at the Bali Legal Aid office in Denpasar, Bali to report on the ban of the Indonesian police on all gathering and assembly in Bali. PM: PGC national organizing committee received the written approval from Bali Intelligence Police allowing the use of RRI for the PGC. AM: Several of the local organizers and volunteers individuals and residents reported receiving anonymous text messages against the PGC. The text messages warned the public from joining the PGC while also accusing the PGC as “anti-development”. 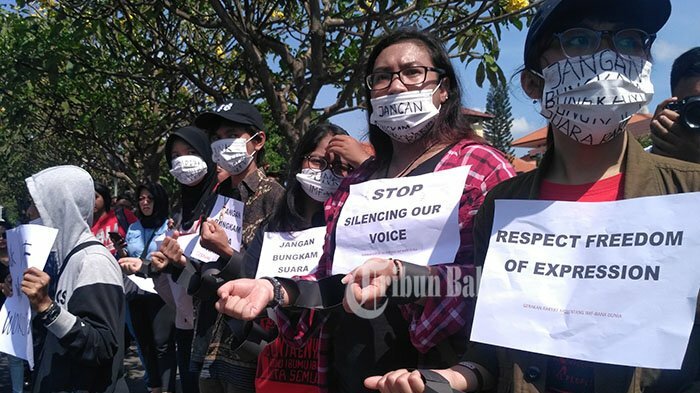 The text messages were sent while several people’s organizations held a rally in Bajra Sandhi Monument, Denpasar, Bali in time for the opening of the IMF-WB Annual Meeting. PM: The PGC National Coordinators (Wawan Sabar and Helda Khasmy) and the Bali Legal Aid Director received another series of text messages from an anonymous number. The sender threatened that they were being monitored and admonished them to desist from holding the PGC. PGC submitted a notice to the Bali Police about the planned mass mobilization on Oct. 12 (opening of PGC) and on Oct. 14 (closing of PGC). The police informed the organizers of the PGC that they would now require a copy of the passports and identification documents of all the international delegates of the PGC. PM: Wawan Sabar of INDIES raised the issue of repressive measures against peoples’ movements and civil society in general, and the Peoples’ Global Conference in particular, at the CSO Town Hall session with IMF Managing Director Christine Lagarde and World Bank Group President Jim Yong Kim. Lagarde and Kim mentioned that they were aware of the PGC and had talked to the authorities. PGC organizers started negotiating with the marketing staff of Hotel Nirmala in an effort to find an alternative venue for the PGC the next day. Hotel Nirmala agreed to host the PGC. Payments were made with the Hotel Nirmala marketing team for the rental of the meeting rooms and food. 2:00 AM: Village paramilitary group harassed and drove away around 20 PGC youth volunteers staying at Bali Legal Aid headquarters. 8:45 AM: Police in the early hours of the morning had informed the managers of the new venue for the PGC that the PGC organizers must submit a police permit for the event. The managers of the Nirmala Hotel told the PGC organizers that they did not know the event was “against the World Bank and IMF” and subsequently cancelled their initial agreement to host the PGC at the hotel. 9:00: Local and international civil society groups gathered at a meeting room in Hotel Nirmala for a debriefing with the PGC organizers. 11:00: PGC organizers and participants gathered in front of Hotel Nirmala for a quick rally and press conference. They were immediately shooed away by hotel staff. Several Bali Intelligence Police officers were present at the Nirmala Hotel and were seen taking videos and pictures of participants. 12:30 PM: Civil society groups at the Bali International Convention Center held a lightning rally denouncing Indonesia’s repressive measure of disallowing public actions and IMF-WBG role in the violation of peoples’ right to free speech and assembly.